I noticed a tiny article in some websites a few years ago that said a “groundbreaking” study published in the Journal of Nanotechnology showed that nanoparticles of silver will bond with and kill virtually all viruses. The report said an unnamed team of scientists from the University of Texas and Mexico University found that silver kills HIV-1 and may also be effective against all other viruses, including the swine flu virus, H5N1, and all of the other deadly new variants of influenza bacterial infections that have been popping up. Many of us know the benefits of colloidal silver as a natural antibiotic and preventative against infections. It is one of those old-time remedies used by our grandparents that fell out of popularity when antibiotics came on the market in the 1930s. So if colloidal silver (minute particles suspended in liquefied base) worked for grandpa, will it save us from those terrible “superbug” staph infections now breaking out in hospitals and possibly cure AIDS? While there may be some hope that colloidal silver will help prevent infection if we get exposed to such diseases, this writer believes the jury is still out on the full benefits of silver as a magical antibiotic against the deadly viral killers. The story floating around on the web appears to have been another hoax. I say this for several obvious reasons. I could find no Mexico University by that specific name although there are universities in Mexico. The University of Texas in Dallas exists, but research of its website failed to reveal a report about this “groundbreaking study.” Also the names of the nano-scientists involved in the research are not given. There is a Journal of Nanotechnology, but a search of its database shows no link to such a report. The story did launch some discussion on a bulletin board in which one writer noted that if such news turned out to be true, the mad rush for silver would have severe implications. He said he has calculated that there is not enough silver in the world nor time to produce enough colloidal silver for all 6.5 billion humans. The writer did note that he once came down with a severe type of influenza that he caught from his brother. The brother had been laid out flat with this bug for over a week and was still recovering after a third week. He said he dosed himself with colloidal silver and experienced very mild symptoms. Consequently, he came to the conclusion that the silver solution might help people infected with serious influenza infections. The silver solution is said to act as a catalyst, reportedly disabling the enzyme that one-celled bacteria, viruses and fungi need for oxygen metabolism. Thus the infective agent suffocates without harming human enzymes or human body chemistry. But doctors disagree. In fact, they warn that long-term use of silver preparations can lead to argyria, a condition in which silver salts deposit in the skin, eyes and internal organs, causing the skin to turn ash-gray. Silver has been removed from products sold at the pharmacy since 1975. In 1999 the U.S. Food and Drug Administration (FDA) ruled that these colloidal silver products were not considered safe or effective. You can still purchase mild preparations of colloidal silver at health food stores, however. While argyria does not appear to affect the health of a person, the pigment changes in skin color are permanent. Articles opposing the use of colloidal silver warn of flim-flam artists that sell ineffective products and the onset of argyria by people who consume too much silver. 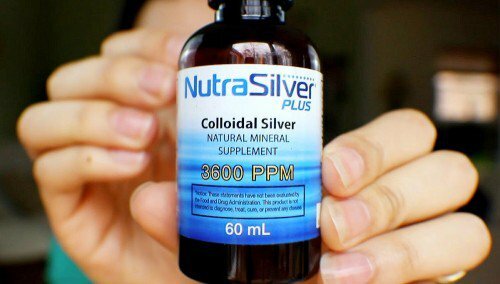 But the articles, that appear to be propaganda designed to protect the drug industry, do not claim that a correct preparation of colloidal silver are ineffective. Thus the jury is still out on this product. If used sparingly it won’t hurt you and may even be of some benefit.